Not all kids need any medical intervention and can continue to lead a normal life without much botheration. The good news, is, with advances in medical diagnosis and treatment, it is possible to treat kids with cardiac ailments, with high accuracy and proficiency. This is the initial alternative usually preferred by the cardiac surgeon. It involves insertion of a thin flexible tube either through an arm or areas near the groin. This tube then makes it way to the place in the heart that needs treatment. Thanks to advancements in medical technology, a lot has improved in this technique and it is much finer than it used to be initially. Cardiac ailments like Atrial Septal Defect (ASD) and Pulmonary Valve Stenosis can be treated using this technique. For ASD, the doctor inserts a catheter into a vein located in the upper thigh and threads its way to heart’s septum. Catheter is just a medium to carry a device made up of two small disks or an umbrella-like device. Once the catheter reaches the septum, the surgeon pushes the device out of the catheter and it plugs the between the atria. Catheter is then removed from the tube, when the device is secured at the septum. For pulmonary valve stenosis, the doctor threads the catheter to the pulmonary valve of the heart, where a tiny balloon carried by the catheter is quickly inflated to push apart the doors of the valve. Once the procedure is competed the balloon is deflated and catheter and balloon are withdrawn. 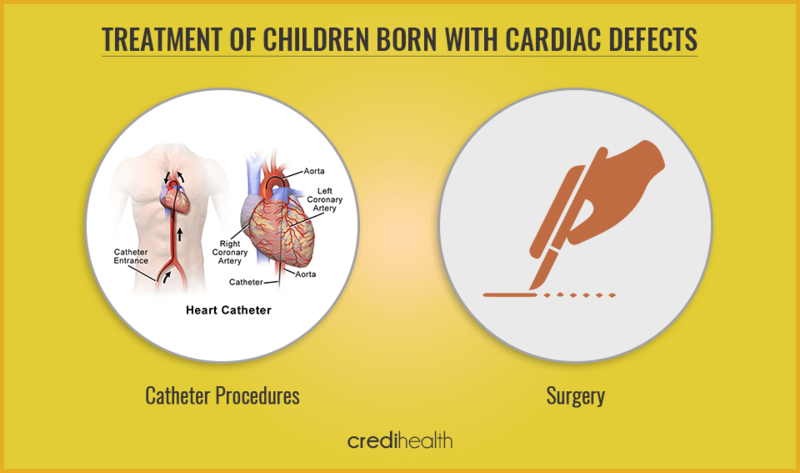 A surgery might be recommended for a child whose heart ailment can’t be fixed using the catheter procedure. Range of surgery includes partial and complete treatment of the defects. They assist in widening arteries or opening heart valves. They also help in closure of holes in the heart or repair of heart valves. You can also read about Symptoms of Heart Problems in Children.